Are there times when you are reading something online or come up with an idea and want to quickly email a friend or colleague? It might be hard to believe but some people do not always have their email client open all day! 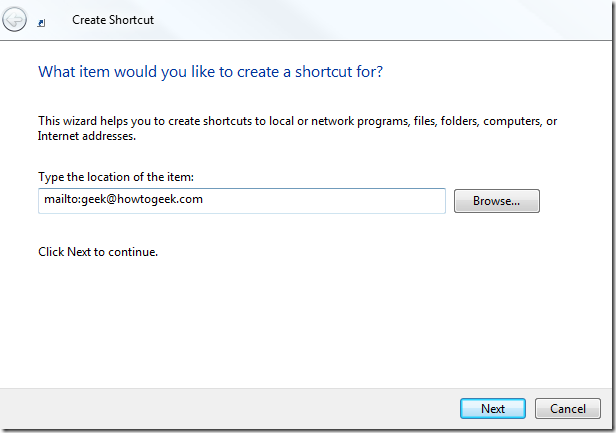 As a time saver for those folks we can create a shortcut on the Desktop to send email. This comes in handy if you email particular contact(s) on a regular basis. Right click anywhere on the desktop and go to New Shortcut. Now in the Create Shortcut window type in “mailto:yourcontact@email.com” of course you will put in your contact’s email. So for instance if I wanted to create on to email The Geek I would put in the following and hit Next. Next name the shortcut something so you will remember what it’s for and click on Finish. Because it is an email and Outlook is my default email client, Vista associates an Outlook style icon for the shortcut. I am not sure how it will look with different clients but you can always Change the Desktop Icon. Now anytime the shortcut is launched your default email program will open up with the recipients email address already filled in. If you want to send the email off to multiple contacts then just separate each email address with a semi-colon. Hopefully this time saver will be useful to somebody out there!